At the Academy’s campus in the South Beach neighborhood of Miami, students have the opportunity to earn both undergraduate and graduate degrees in our Miami location’s two programs: filmmaking and acting for film. 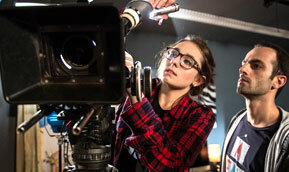 Designed for students who have already earned a Bachelor’s degree from a post-secondary institution, the Academy in Miami offers two Master of Fine Arts (MFA) degree programs in filmmaking and acting for film. As an MFA is the highest degree a student can earn in the arts, students spend two years intensely learning and practicing their area of study under our faculty of working professionals in order to best prepare them for a career in the entertainment or a related industry. Students can learn more about the admissions requirements for our MFA by clicking here. 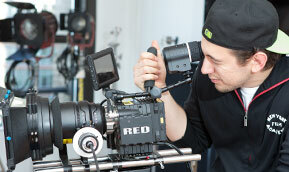 For students interested in obtaining an undergraduate degree from the Academy’s Miami location, we offer Bachelor of Fine Arts (BFA) degree programs that allow students to concentrate the majority of their education in the study and practice of their chosen craft — filmmaking or acting for film — while also completing a series of Foundation Studies courses in the Liberal Arts and Sciences that help students to become well-rounded in the Humanities and Sciences. The BFA programs last either eight or nine semesters depending on the program and students have the option to complete their chosen BFA program in three years, without taking summer breaks, or in four years with summer breaks. To learn about the admissions requirements for the BFA programs, please click here. For students uncertain if they wish to commit to a degree program, the Academy in Miami also offers one-year conservatory programs and if a student wishes to continue his or her studies, he or she can apply his or her credits towards advanced standing in a degree program. Students wishing to learn more about our MFA and BFA programs can contact NYFA South Beach by calling us at +1 (305) 534-6009, emailing our Miami staff at southbeach@nyfa.edu, or by clicking on the following links for each individual degree program.